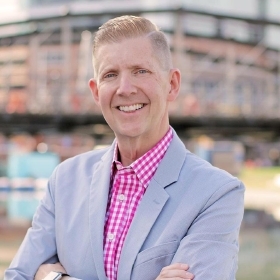 Patrick Kaler, President & CEO, Visit Buffalo Niagara, has more than 25 years' experience in the travel and tourism industry. He joined Visit Buffalo Niagara in January of 2014 as President and CEO overseeing the destination marketing organization, convention center and sports commission. Before moving to Buffalo, he served for three years as President and CEO of Visit Loudoun and previously oversaw Los Angeles Tourism and Convention Board's international offices in Australia, China, Europe, Japan, South Korea and Latin America, managing major international and domestic travel trade and airline sales and marketing initiatives. Kaler has also served as Executive Director for the Lake Tahoe Visitors Authority/Tahoe Douglas Visitors Authority/Lake Tahoe Gaming Alliance, Great Lakes of North America and the Galena/Jo Daviess County Convention and Visitors Bureau. Prior to those positions, he was the General Manager with Keeshin Destination Chicago and Director of Sales and Marketing at the Champaign-Urbana Convention and Visitors Bureau. He has also served as adjunct faculty, lecturer and speaker at the University of Illinois, UCLA and Lake Tahoe Community College; as well as numerous tourism conferences. Kaler holds a Master of Science degree in Tourism from the University of Illinois at Urbana-Champaign and a Bachelor of Science degree in Recreation, Parks and Tourism Administration from Western Illinois University. Currently, he serves on the U.S. Travel Association's Board of Directors, as well as Chairman of U.S. Travel Association's Destinations Council Advisory Board. Kaler was recently elected Vice-Chair of the New York State Destination Marketing Organizations; and serves on the board of directors of Buffalo Niagara Partnership, Frank Lloyd Wright's Darwin Martin House, Buffalo Community Foundation's Project Play Western New York Advisory Council, Buffalo Civic Auto Ramps, Eric Wood Foundation and is a 2014 graduate of Leadership Buffalo.